If you’re parent to a child with special needs, anxiety is the order of the day. Most of your waking hours, you’ll likely be anxious about how you’ll mete out the appropriate care for your disabled child. Taking care of a healthy child is difficult enough; having to deal with a disabled one takes twice the amount of energy – physically, mentally, and emotionally. However, do not become despondent. Many parents caring for disabled children have been successful and you can too. Here are a few sage suggestions to consider when dealing with a disabled child. Adapting to a new circumstance is not easy. You may even blame yourself for your child’s condition, but take heart in knowing that it’s normal to grieve and feel hurt. Instead of focusing on your child’s disability, focus on what he or she can do. Learn more about your child’s condition and embolden yourself. After all, your child will need you every step of the way. Understanding your child’s situation is comparable to learning a new language. It’ll get rough, at first, but once that’s out of the way, you’ll later feel like an expert. If your child is suffering from Down Syndrome, for example, with your help and support, they can live normal lives. “My friends will never truly understand my situation”, you might lament at times. True, that may be the case – they do have healthy and highly active kids. It’s normal to feel that way, but never allow yourself to become isolated and withdrawn to the extent where you become immobile or crippled. Confide in someone, you don’t have to go at it alone. They might not fully comprehend the gravity of your situation, but if they’ve offered help and support of their own volition, take advantage of it. Caring for a disabled child is debilitating. While you’re up and about tending to that child, you might neglect your entire health. A vehicle must refuel to move from one location to the next. Your health is no exception. Get sufficient rest, exercise when possible, eat appropriately, and smile when you can. Your strength will be needed to properly care for your disabled child. As underscored earlier, rearing children with special needs is nothing casual. It devitalizes the mind and body. You can actually feed your special needs child with so much attention that you forget about everything else, including your responsibility to your other healthy children. Your other children might feel neglected, in some cases, jealous. Especially if you’re married, your marriage might suffer a terrible blow. If you find that you’re actually neglecting your children or spouse, there’s still time to catch on. Why not spend time planning and engaging in activities that other members of the family find refreshing? To strengthen the bonds of your marriage, why not liaison with your mate so that you’re both involved? In most cases, mothers tend to take the lead in caring for their special needs children. If you’re a father, communicate with your family to ensure everyone’s on board. Mothers are extraordinary caregivers, but the husband should take the lead in ensuring the needs of his family are met. Have them involved with special education or programs. Communicate with the child’s teacher. You could have the teacher allow the child to sit up front and give them additional time to complete class work. Instead of participating in written exams, have the child take them orally. If the said child is homeschooled, the principle stands. Keep learning equipment at home. Children with learning disabilities are mostly disorganized and forgetful. Have them keep another set of textbooks at home for reference and study. Have 15 minutes of reading sessions daily. A highlighter could be used to highlight challenging words, and as the child reads aloud, have him follow with a ruler. Be practical. Especially when teaching maths, use objects to teach for measuring quantities. For spelling, use magnetic letters. 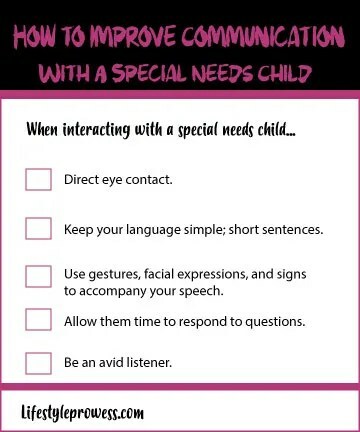 Always make eye contact when communicating with kids with ADHD. Homework should always be tackled in tranquil areas, where distractions are at a minimal. Regular breaks should be allotted. To contend with hyperactivity, allow them to perform chores that involve being energetic. This could include taking the dog for a walk, under your supervision, of course. Keep your language simple; short sentences. Use gestures, facial expressions, and signs to accompany your speech. If they hesitate to answer or respond, allow them time. With a disabled child, you’re not promised a quiet and easy life – far from it. However, when dealing with children with disabilities, you can come out victorious with the right guidance and support.